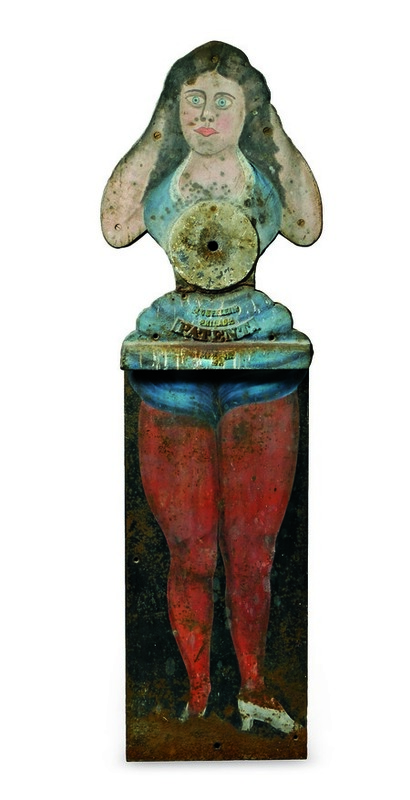 This cast-iron figure of a woman is marked ‘Wurfflein/Philad./Patent.’ She is a rare, life-size shooting gallery target that is over 100 years old. Skinner Inc. auctioned it in March 2015 for $43,050. BEACHWOOD, Ohio – Trying to be politically correct in the antiques and collectibles world is becoming more and more difficult. No, this isn’t a dollhouse. It is a Victorian sewing box worth $3,075. The roof covers a tray with sewing implements and thread, important tools in the days when home sewing was important. BEACHWOOD, Ohio – Every household had a person who could make, alter and mend clothing before the sewing machine was invented in 1842. Learning to darn, mend and make samplers was part of the education for girls rich enough to go to school in a city. So every family had a sewing basket or table with all of the needles, thread, scissors and other small items used when sewing. The main room of the house, near a fireplace or stove, often was the place chosen to keep the sewing supplies, and the wife did the sewing in the evening while chatting with her family. The sewing box was attractive, often a skillfully crafted wooden box or even a table with a lift top that opened to a bag that held fabrics. 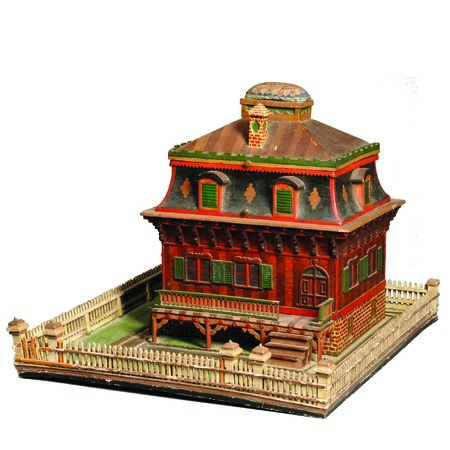 But sometimes the sewing box was imaginative, made in the shape of a house or covered in painted designs. At an auction last year a decorated folk-art Victorian sewing box was offered for sale. The house-shaped box had a fabric-covered pincushion in the center of the “roof,” which opened to expose a compartmented lift-out tray. The house had a brick foundation, front porch and windows with shutters. It was in a 20-by-2-inch “yard” with a picket fence. It looks like a dollhouse, so it must have been tempting for children to try to see inside. 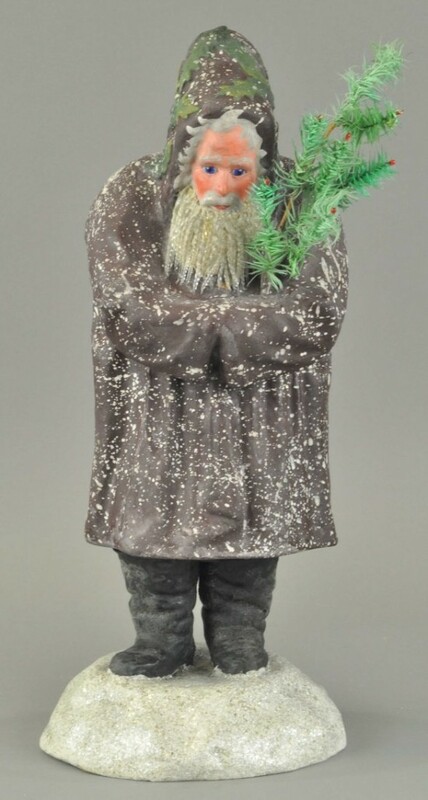 It sold for $3,075 at the Skinner auction in Boston. Q: We got this personal Camel cigarettes tin ashtray from my husband’s aunt several years ago. We still have the original box it came in. His aunt came from a time when women didn’t smoke in public and she had to sneak her cigarettes. What is it worth? A: This portable tin Camel “cigarette case” is small enough to fit into a pocket or purse. When you push in the bottom of the box, the retractable ashtray slides out and the cigarette rest pops out. They sell online for about $6 to $12. Q: I have a large cup with a handle that has writing and pictures on it. There is a poem on one side. On the other side is a bundle of wheat sheaves in a circle and the words “In God we trust, The Farmer’s Arms.” Four pictures of farm implements are around the circle. The cup is marked on the bottom “Adams, Est. 1657, England.” Is it old or valuable? A: Your cup was made by William Adams and Sons, which was founded in Staffordshire, England, in 1769. The date in the mark refers to an earlier pottery founded by John Adams, a relative. William Adams and Sons became part of the Wedgwood Group in 1966. The name “Adams” was used on some items through 1998. This large cup is sometimes called a “mush cup” and sometimes just a large coffee cup. It was made in the late-19th or early 20th century, and sells today for about $30, double if there is a saucer. Q: I’m looking for information on a chair made by the B.L. Marble Chair Co. of Bedford, Ohio. Can you help? A: The company was founded by Barzilla L. Marble. He worked at two other Bedford furniture makers before going into partnership with A.L. Shattuck to found The Marble and Shattuck Chair Co. in 1885. Marble founded the B.L. Marble Chair Co. in 1894, making wooden chairs. The company made office furniture beginning in 1910. It merged with the Dictaphone Corp. in 1965 and the name became the Marble Imperial Furniture Co. The company went out of business in 1985. Q: My mother was given a pewter vase as a wedding gift. It’s inscribed on the bottom “Pewter by Calatoff, hand wrought 5075.” My mother is 95 years old, so I know the vase is very old, though not necessarily valuable. What can you tell me about its age and value? A: The maker is Galatoff, not Calatoff, and it probably was made in the early 1940s, assuming your mother was married when she was in her early 20s. We couldn’t find any information about the maker, but Galatoff pewter items sell for moderate prices. An ice-cream bowl was listed for $20, a two-handled centerpiece bowl for $30, an incense burner for $20 and a jug for $75. Q: My dad was given a wooden boat model built by prisoners when he was the administrator of the Leesburg Prison Farm in Leesburg, New Jersey, in the late 1940s. It was a gift. It’s a cabin cruiser, 36 inches long, and is in good condition. I’d like to know where I might be able to sell it. A: Prison art is collectible. If you search the words “prison art” online, you’ll find several sites that sell prison art or buy it. Some prisons offer art therapy or art lessons for prisoners, while others provide the time or materials for the prisoner to produce art on his own. A Tennessee art college worked with prisoners on death row to create work for a gallery showing. Those who sell prison art must buy it first. One of the sites might buy your boat. Tip: Candle drippings can be removed from fabric or furniture with the help of ice cubes. Rub the wax with the ice until the wax hardens. Scrape off the hard wax with a credit card or stiff cardboard. If some wax remains, put a blotter over it and then iron with a cool iron. Terry Kovel and Kim Kovel answer as many questions as possible through the column. By sending a letter with a question, you give full permission for use in the column or any other Kovel forum. Names, addresses or email addresses will not be published. We cannot guarantee the return of any photograph, but if a stamped envelope is included, we will try. The amount of mail makes personal answers or appraisals impossible. Write to Kovels, Auction Central News, King Features Syndicate, 300 W. 57th St., New York, NY 10019. Current prices are recorded from antiques shows, flea markets, sales and auctions throughout the United States.Prices vary in different locations because of local economic conditions. Bank, standing lion, tail right, cast iron, A.C. Williams, 1920s, 3 3/4 inches, $55. Cigar cutter, Robert Burns Cigars, Conway Cigar Co., countertop, c. 1910, 6 x 5 inches, $120. Pottery teapot, lid, Canton pattern, twisted asparagus handle, cobalt blue and white, pagodas, 1800s, 7 inches, $130. Dollhouse furniture, cradle, yellow slip, alphabet, redware, c. 1860, 4 x 7 inches, $210. Clock, shelf, Medieval-style, cast bronze, bell shape, inscription, enameled numerals, c. 1900, 12 inches, $220. Coca-Cola, sign, Time Out For Coke, Drink Coca-Cola, woman, bottle, dog, 1950, 38 1/2 x 22 inches, $240. Contemporary glass vase, Aurene, blue daffodils, lily-of-the-valley, Kathy Orme, Orient & Flume, c. 1977, 11 inches, $470. Tavern table, English oak, plank top, angled turned bulbous legs, stretcher, 1700s, 28 x 42 inches, $740. Silver spoon, King pattern, monogram, Hayden & Gregg, c. 1850, 11 1/2 inches, $1,060. New! There is hidden value in contemporary pottery. You find it at shops and garage sales at low prices, because the marks are unknown. Kovels special report “Kovels’ Identification Guide to Contemporary American Pottery 1960s to Present” (available only from the Kovels) includes more than 180 marks and 60 featured artists. Each artist’s biography includes a mark, a pictured piece and this year’s price. Available only from Kovels for $19.95 plus $4.95 postage and handling. Order by phone at 800-303-1996, online at Kovelsonlinestore.com; or mail to Kovels, Box 22900, Beachwood, OH 44122. © 2016 by Cowles Syndicate Inc. 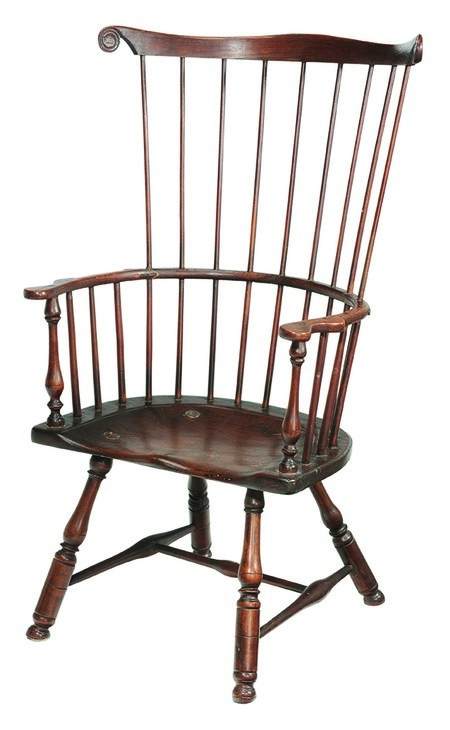 This comb-back Windsor chair was made in Pennsylvania in the late 18th century. It auctioned in 2015 for $1,003 even though it had some breaks in the wood and added metal braces used for repairs. BEACHWOOD, Ohio – The Windsor chair was first made in the late 17th century in England and about 1730 in America. The chairs are similar, but the English chair legs are less splayed and only the English chair has a splat (a shaped piece of wood) as part of the back. 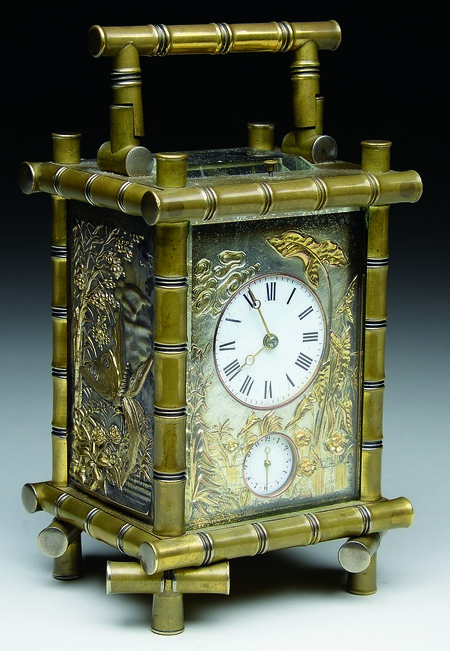 An unusual carriage clock made with Japanese-style decoration sold at an auction in Maine this year $3,355. It was made of embossed brass and glass, and was only 6 inches high. Like all carriage clocks, it had a handle so it could easily be carried on a trip in a horse-drawn carriage. BEACHWOOD, Ohio – New Years Eve is the holiday that is represented by a clock. Some say a ticking clock is the heart of the home. 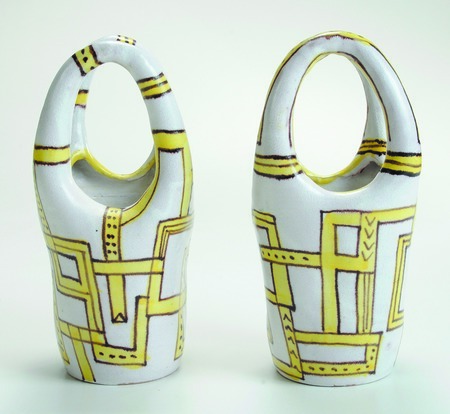 A pair of Guido Gambone vases with high looped handles and a yellow and purple geometric design sold at auction in 2015 for $4,012. BEACHWOOD, Ohio – Guido Gambone (1909-1969) was an important Italian ceramic artist in the 1950s and ’60s. His colorful vases in modern shapes with almost comic-strip-shaped animal figures were very different from designs by earlier Italian makers. He used thick glazes that left a rough surface. 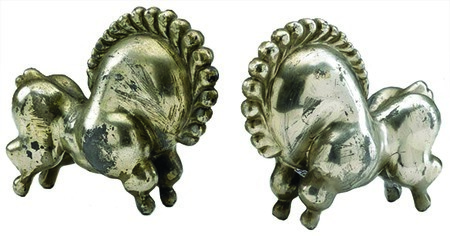 This hard-to-find nickel-plated pair of bookends by Russel Wright is called ‘Libbiloo.’ The pair was estimated at auction in 2015 for $10,000-$15,000. BEACHWOOD, Ohio – Russel Wright (1904-1976) worked as an industrial designer, a job created in the 20th century. In the 1920s, he worked in the theater making sets and props. After 1929, he formed a company with his wife, Mary, who was also a designer, designing furniture, radios and useful household accessories made of spun aluminum, stainless steel, paper, wood, glass, plastic and ceramics. 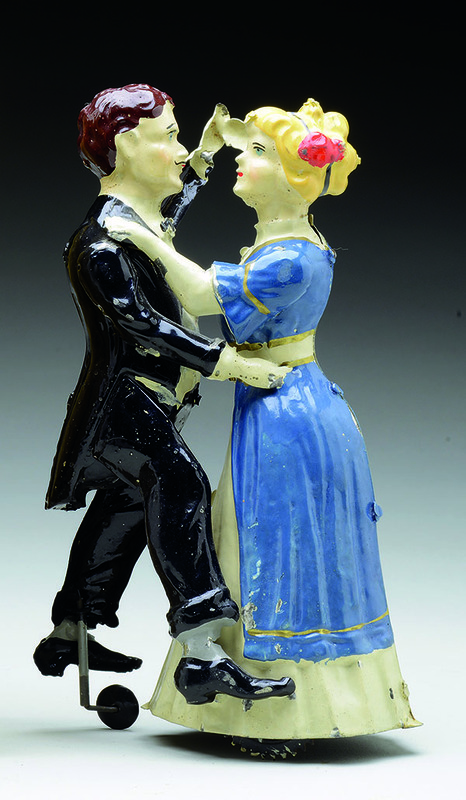 This pair of tin figures can dance across the floor when wound with a key. It was made about 1916, when the tango was the most popular dance. It sold at a June auction for $3,851. BEACHWOOD, Ohio – The tango was introduced in Argentina about 1902, but didn’t become the latest dance craze until about 1916. It spread to Paris, the United States and Europe, and remained a favorite until the 1920s. The tango was popular in upper-class dance parlors and has gone in and out of favor. 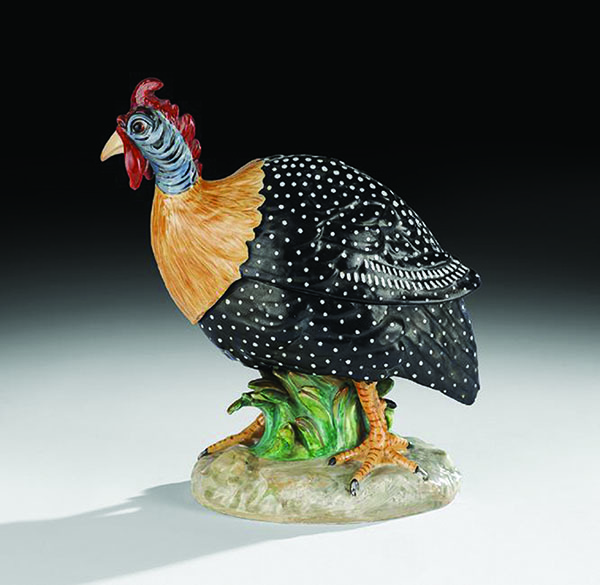 This 11-inch-long 19th-century French tureen by Jacob Petit is a good likeness of a guinea fowl. The rare piece of porcelain sold for $5,417 in 2015. BEACHWOOD, Ohio – No, it’s not a turkey. This tureen is in the form of a guinea fowl. It sometimes is eaten in the United States, but it usually weighs less than four pounds and is much too small to feed the crowd at Thanksgiving dinner. This figural napkin ring sold at a Maine auction for $889. 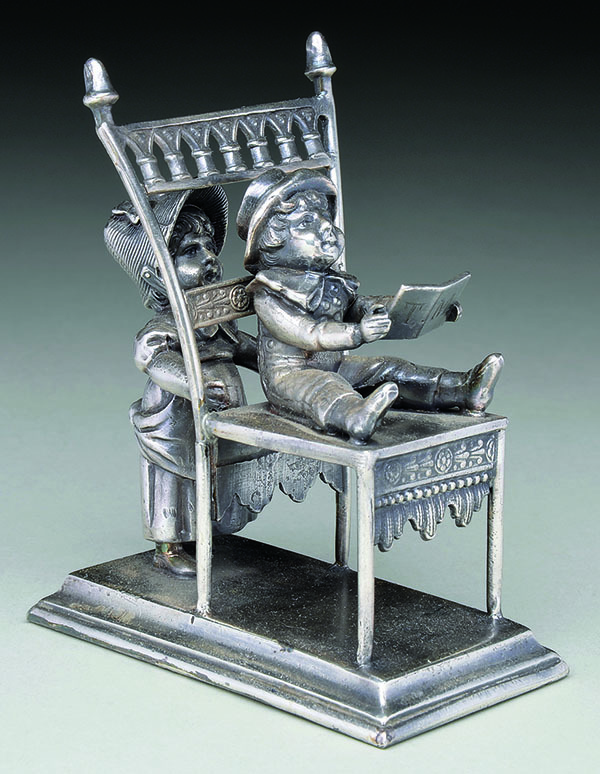 The two figures, attractive chair, maker’s mark and condition of the silver plating all added up to a high value. BEACHWOOD, Ohio – Antique napkin rings are used today as part of the new “green” movement. The cloth napkin used at dinner, if almost clean, can be carefully folded, rolled up and saved in the napkin ring. It saves soap, water and the energy needed to launder it after each meal.